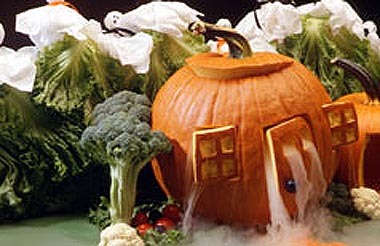 When I was on ABC's "Home Show," we always had a pumpkin-carving contest in October. It was always exciting to see which member of our TV family would come up with the most creative pumpkin. I desperately wanted to win the contest, so I decided to contact a famous sculptor, Ed Fraughton, who had been a longtime friend. I talked him into working with me to see if we could take a pumpkin and sculpt one of the presidents. When we got together, he told me that the pumpkin was far too hard for sculpting a presidential head. We spent a creative evening as we decided what to do instead. The idea we came up with was so good that I have been sharing it with friends for years. 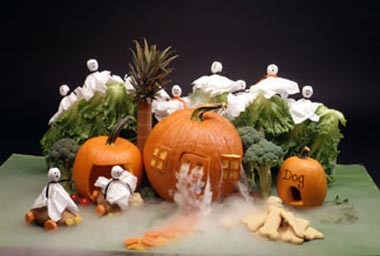 You could even have each member of the family make his own haunted house, making a street of pumpkins. Plan now to have a pumpkin-carving contest with your family and friends. Is this eerie scene an HALLucination? Position the pumpkin with the flat side as the front of the house. Cut the top off the pumpkin at an angle so that the lid will fit securely. Clean out the seeds and membranes with an ice cream scoop. These ghosts in the trees make the scene even more festive. Near the middle and slightly up from the bottom, carefully cut out a rectangle for the door. Cut a square on each side of the door to make two windows. Remove the door and each window in whole pieces. Trim the window and door pieces to about 1/2"? thick by carefully shaving the inside. Cut and remove individual windowpanes. Replace the windows in the pumpkin, allowing them to jut out ever so slightly. Position the door on the pumpkin as though it were just being opened. Place the pumpkin on the plywood and the can in the bottom of the pumpkin. 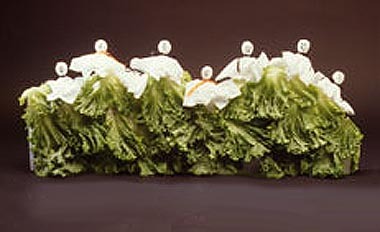 Use broccoli and lettuce leaves for shrubbery. To make the tree, stick several toothpicks into the bottom of the pineapple top in order to stabilize it in the top of the paper towel roll. Wedge the tree securely between the pumpkins. 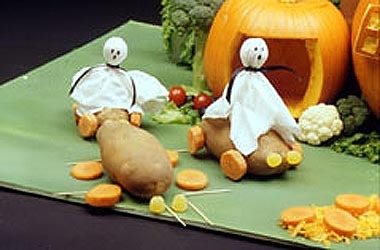 Potatoes make excellent cars for ghosts. Make a car from the potato, using carrot slices for wheels and gumdrops for headlights. Make ghosts by tying facial tissue over round suckers with ribbon or black string licorice. Just before your guests arrive, fill the can half full of hot water and add dry ice. Dry ice gives the house a ghostly effect. Dian has been sharing her creative ideas for more than 30 years in books, on TV and in speeches.�She now had a special offer to save 60% on 5 books and 1 DVD. Get Dian's creative library for only $40.00. Save $60 and have more than 25 years of her creative and amazing ideas. This package will be great for gifts, for fun, and for kids and grandchildren. You will never run out of ideas when you have this wonderful set of books. Take advantage of this limited offer at www.DianThomas.com.